This post briefly goes into a solution I am investigating to create RFID based door openers. The idea is to have a series of doors, each openable using an RFID card paired to that specific lock / reader / door / unit. Looking for a simple way to create a series RFID readers which are able to operate wirelessly, I came upon the following post by Josh Tananbaum / the GeekMovement . I bluntly copied the RFID part of “parts needed” from the GeekMovement post here. 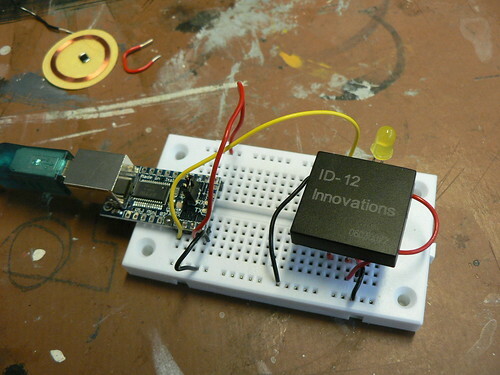 The ID12 is a short range RFID reader that sends the ID on theRFID card in a serial stream through pin 9 to any device including the Arduino board in the TUNE Glove. In that solution the Arduino board then sends this data to the XBee module, using the NewSoftSerial library. What the code for the TUNE Glove seems to do is contstruct the numbers and then pass them from Arduino to XBee. It is possible that you do not need the Arduino. This post by Lynnlinse seems to suggest (using a different type of RFID reader) that is doable. As the ID12 sends serial data in a specific Baud-rate, the XBee can be used to simply broadcast that wirelessly to the XBee base station. The software on the main computer, which can be a solid state machine like the FitPC2 or a low cost machine like a Netbook, can then translate the raw serial data from the reader. Something to test out. It would dramatically simplify remotely readable RFID readers as you will only need the RFID card reader and the XBee module. Creating an RFID reader appears to be relatively simple, thanks to the use of serial data. Right now I have no clue what RST and FS are doing and why they are made respectively set to high (5V) and low (GND). As a layman, what I did not know existed are the single-chip Voltage regulators. The base models are step-down regulators with an output of 3.5V and 5 Volts. Perfect when you need to add XBee or WiFly to your experiments. Another neat thing is the NewSoftSerial library for Adruino, allowing you to turn any set of pins into additional RX/TX pins with free to set baud rates. It is based on Ladyadas AFSoftSerial, uses “interrupt driven receives” and is written by Mikhal Hart. What is handy to know is how to use the library, which is quite simple. I copied and pasted the SoftSerial elements from the GeekMovement TUNE Glove project. I found another RFID project on the Arduino Playground Wiki. It does not state who wrote the article. The cote is attributed to: “vgrhcp”. That project also uses the NewSoftSerial library to allow communication to both the RFID reader and a computer or device. The Electric Strike lock is what you will find in almost any door with an electric opener via an intercom system. 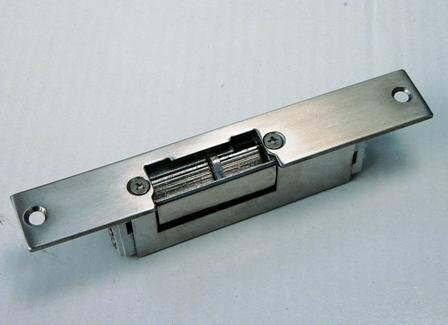 Its internals contain an electro magnet that – when activated – releases the strike and allows the door to be pushed open. When the electromagnet is disabled, the strike will block again. You can buy Electric Strike locks operating at 12 Volts. Conveniently the same amount as for an Arduino board.